A back-and-forth first half had the Falcons (1-6, 1-2 MAC) taking a 6-0 lead after a pair of field goals in the first quarter. Ohio (5-2, 2-1) took the lead with a A.J. Ouellette touchdown run to start the second period, but the BGSU regained the lead, at 13-7, less than two minutes later. The Bobcats were back in front after a Bradd Ellis interception return, but with 2:37 left in the first half, Bowling Green regained the advantage at 16-14 after another field goal. With just over a minute left in the half, Nathan Rourke scored on a seven-yard run, giving the guests a 21-16 lead at the break. The hosts scored the first touchdown of the second half, regaining the lead at 23-21. Rourke scrambled for a 75-yard touchdown to give Ohio a 27-23 edge before the end of the third. 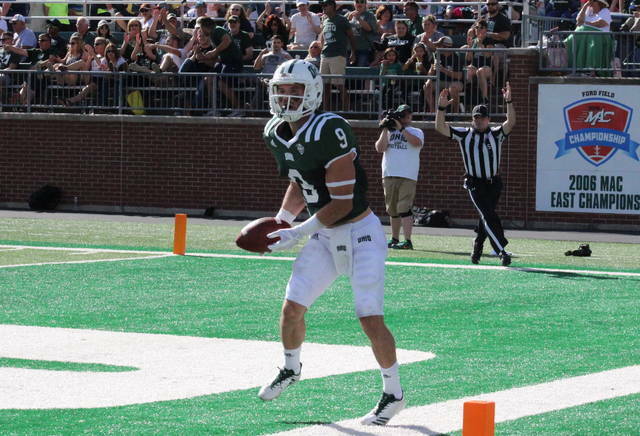 Ohio went ahead 41-23 within the opening five minutes of the fourth quarter, as Rourke tossed a 40-yard touchdown to Andrew Meyer, and Ouellette scored on a two-yard run. BGSU cut the margin to 11 points with 9:23 to play, but Rourke punched on a one-yard run with 1:55 to play, sealing Ohio’s 48-30 win. OU held a 440-to-421 advantage in total offense, including 335-to-229 on the ground. The Bobcats earned a 4-to-2 win in the turnover battle. Rourke was 7-of-22 passing for 105 yards and one touchdown, while leading all Bobcat rushers with 143 yards and three touchdowns. Ouellette had 123 yards and two scores on 24 carries, while Meyer had 84 yards and one touchdown on three receptions. A complete recap of Ohio’s win at Bowling Green will available in Tuesday’s edition of The Daily Sentinel.